The Krommen Kelchbach district is situated in Naters – Switzerland. 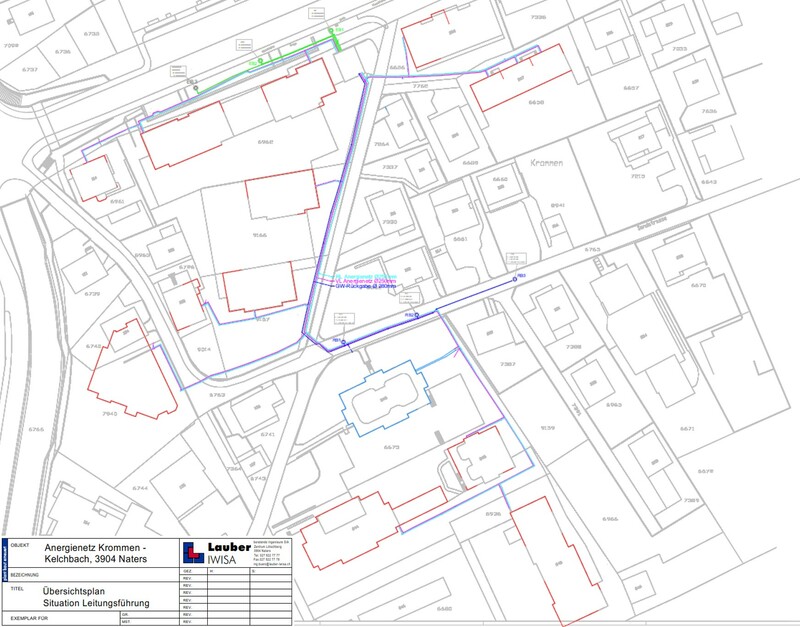 A low-temperature district heating and cooling network (LTN) was built in 2012, and has been in operation since 2013. The LTN connects 13 residential buildings, which were built between 1970 and 2010, to ground water wells, which act as a geothermal source. The pipes bring ground water at 8-18°C to the technical room where it passes through a filter and then to the heat exchanger. The return pipes send the water back to the ground at 4-14°C (a temperature difference of maximum 4°C is fixed). From the exchanger, the water goes to each building, using the anergy network. This water can be either used for cooling the building or be used as a source of heat for the heat pump that produces warm water for the floor heating system and domestic hot water. The water, which has seen a change in temperature, goes back into the anergy network until it reaches the main heat exchanger situated in the technical building and is reheated (or cooled) by the ground water. The energy network is currently managed by a Saia automation system that continuously measures the temperatures and mass flows of the network (but not the heat flows within the buildings). Cheap hardware (i.e. gateways) have been installed on each heat pump or key component to eventually permit all components to communicate providing new possibilities to manage the energy network. The gateways are being tested one-by-one to make sure they work on command i.e. start and stop, before they can be tested to work together. Over the following winter, optimisation models will be tested to see how the heat pumps react together to different rules. Giving direct feedback to users or network managers and reduce system failures.